Among the greatest and most profound of all biblical teachings are the parables of Jesus Christ. During His three-and-one-half-year ministry, Jesus spoke from thirty to fifty parables (depending on which scholar's estimate you wish to accept). There are some very important reasons why Jesus used the parabolic method of teaching. And for today's Christian there is much vital meaning contained within these rustic examples which were taken from everyday life in ancient Judaea and its environs. A series of articles beginning in this issue will make that meaning come to life. SHOULD IT be surprising that Jesus used parables? Not if you understand something of the Jewish world in Christ's day. States the noted scholar Alfred Edersheim: "Perhaps no other mode of teaching was so common among the Jews as that by Parables" (The Life and Times of Jesus the Messiah [Grand Rapids, Mich.: William B. Eerdmans Publishing Co., 1972], p. 580). The Jewish people were quite familiar with the parabolic method of teaching and had been for some time. In a footnote on the same page, Dr. Edersheim informs us: "... Every ancient Rabbinic work is literally full of parables." Even the Old Testament itself contains many parables. The Prophet Ezekiel used about four. A good example is found in Ezekiel 17:2: "Son of man, put forth a riddle, and speak a parable unto the house of Israel." The prophet then proceeds to unfold a strange story of a great eagle and a giant cedar tree. Later in the same chapter, he explains the meaning of this unusual story. In II Samuel 12 the Prophet Nathan tactfully used a parable to convey a message from God to King David. Isaiah 5:1-6 also contains a parable which was used as a song — again conveying an important message to the people by the parabolic method. Verse 7 explains the meaning. In most cases a parable is a story drawn from everyday life. It is usually symbolic or metaphoric in nature — often conveying a profound spiritual lesson. Most parables use imagery to which the average person can readily relate. As the hearer comes into daily contact with the image or symbol (i.e., a field, a fig tree, etc. ), he is easily reminded of the parable in which the imagery is used. In order to gain the maximum value from Jesus' parables, we must, therefore, acquire at least a rudimentary understanding of the elements used in those stories. And we must gain an elementary understanding of the geography involved. This we will do as this series of articles unfolds. There are several very good reasons why Christ chose to use the parabolic method of teaching. The most obvious reason is that it was commonly accepted among the Jewish people of that day. When a teacher launched into a parable, most listeners were conditioned to respond and knew how to receive such teaching. "And the disciples came, and said unto him, Why speakest thou unto them in parables? He answered and said unto them, Because it is given unto you to know the mysteries of the kingdom of heaven, but to them it is not given." What Jesus was saying was that the people were not really ready at that time to receive the profound truths of God's Kingdom — only the 12 disciples were. Therefore, He sometimes used parables without explaining them to the people. He did, however, privately interpret them to the disciples. When the people heard the parable, it seemed like a simple "folksy" story of no particular spiritual significance. They heard and understood it only on a physical level. The spiritual meaning escaped them! Jesus continued: "Therefore speak I to them in parables: because they seeing see not; and hearing they hear not, neither do they understand" (verse 13). Jesus knew that the general populace was not yet ready to receive the deeper truths of His way of life. Had He explained certain parables plainly, they would have been accountable for what they had learned. As James later said: "Therefore to him that knoweth to do good, and doeth it not, to him it is sin" (James 4:17). The truth of God is too precious to be thrown about indiscriminately! In Matthew 7:6 Jesus taught us an important principle: "Give not that which is holy unto the dogs, neither cast ye your pearls before swine, lest they trample them under their feet, and turn again and rend you." He was not calling people "dogs" or "swine"; He was merely explaining the reaction of some people to the truth of God. Many people, when exposed to the truths of God's Word, will treat them with contempt and persecute those who have given the truth to them. A Christian should, therefore, use discretion in determining to whom he will explain the undiluted stronger truths of God. Jesus sent His disciples on a preliminary evangelistic tour with this instruction: "Behold, I send you forth as sheep in the midst of wolves: be ye therefore wise as serpents, and harmless as doves" (Matt. 10:16). Jesus always privately explained the intended spiritual meaning of each parable to His disciples. But there are other instances in which the people to whom the parable was addressed also knew the intended spiritual meaning! It depended upon who was addressed and under what circumstances. Not all parables were given to the masses of people who followed Jesus. Some were given exclusively to the disciples. Others were addressed directly to the religious leaders of the day — the scribes and Pharisees. And they knew exactly what Jesus meant, as we shall see as we progress into this series of articles. What many have not realized is that the parables were given in three distinct sets or groupings. Each set or group of parables had a theme or overall message. And each set became progressively stronger in its meaning and impact. Each group of parables was presented against a different geographical background and at three distinct points in Christ's ministry. Each set was provoked or stimulated by a different set of circumstances. To really gain the most out of a study of the parables, one must examine them in their proper chronological sequence and historical context. Having grown up in Nazareth, Jesus later moved to the town of Capernaum near the Sea (or lake) of Galilee. He may well have owned a home there. (For more information about the life of Jesus, read our free booklet entitled The Real Jesus.) It was in the province of Galilee that He worked as a carpenter following in the footsteps (hammermarks?) of His father Joseph. This provides the setting for the first group of parables, which may be called the "Galilean Parables." This set of parables was given early in Jesus' ministry. "The same day went Jesus out of the house, and sat by the sea side [Sea of Galilee]. And great multitudes were gathered together unto him, so that he went into a ship, and sat; and the whole multitude stood on the shore. And he spake many things unto them in parables..." (Matt. 13:1-3). Here we have the setting: Jesus was sitting in a small boat (probably a fishing vessel) near the shore of the freshwater lake of Galilee. A large crowd was standing on the gently sloping hillside, which blended into the calm and beautiful lake. This setting provided a natural amphitheater. The boat functioned as a speaker's platform or stage; and His voice was carried across and reflected by the water to the shore, where the people were standing. The sloped sides of the lakeshore provided a natural acoustical "backdrop" for the audience. In short, the speaking conditions as found in nature were as nearly ideal as possible in the days before electronic amplification. This first set consisted of a total of ten parables. The first six of these are addressed to the people. The remaining four were exclusively for the disciples. Remember, the account of Jesus' ministry is given in four different biographical books, called "Gospels." To gain a truly comprehensive picture of all of Jesus' parables, each of these accounts must be carefully compared. (The best comparison tool now available is probably A Harmony of the Gospels for Students of the Life of Christ by A. T. Robertson and published by Harper and Row.) The first three Gospels (Matthew, Mark and Luke) are called "Synoptics." That is, they are all thought to have basically originated from a common source — the Gospel of Mark. Each writer, though inspired by the Creator God, wrote from a somewhat different point of view. The Apostle John apparently wrote much later and did not see the need to include much of the material written in the first three books. For an accurate picture of this first grouping of parables, it is best to compare Matthew 13, Mark 4 and Luke 8. In so doing, you will notice that Mark includes two parables in this first set which are not found in Matthew 13. This represents the set of six parables given to the people. "All these things spake Jesus unto the multitude in parables; and without a parable spake he not unto them: That it might be fulfilled which was spoken by the prophet, saying, I will open my mouth in parables; I will utter things which have been kept secret from the foundation of the world". (Matt. 13:34-35). The prophet spoken of is Asaph, a Levite and the leader of the singers in ancient Israel. He wrote many centuries earlier: "I will open my mouth in a parable: I will utter dark sayings of old" (Ps. 78:2). So Jesus was actually fulfilling prophecy when He spoke these parables. The first group of six parables was not explained to the people at that time. But Jesus, in private, did personally explain each one to the disciples at a later time. "Then Jesus sent the multitude away, and went into the house: and his disciples came unto him, saying, Declare unto us the parable of the tares of the field" (Matt. 13:36). (He had already explained the parable of the sower to them — verse 18). These parables were given as lessons to the disciples in particular. Jesus did not obscure the meaning in any way. Rather, He illustrated some very important moral and spiritual lessons which were aimed directly at the disciples. A common theme runs throughout these ten parables, whether they be addressed to the general public or to the disciples. They all refer to the Kingdom of God. Each parable is designed to motivate those who understand to really want and desire the Kingdom. They show how the Kingdom will grow, flourish and ultimately dominate the entire world. They demonstrate the need to seek God's coming Kingdom with every fiber of our beings. Future articles in this series will explore in detail the marvelous truths contained in this first set of parables. Also expounded and explained will be the many deep truths contained in the remaining two groupings of parables given during Jesus' three-and-one-half-year ministry. 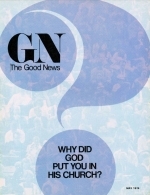 Be sure to watch for these informative articles in succeeding issues of The Good News magazine.